Hi. The page info shows version 1.435 but the download seems to be for version 1.433, is this correct? Yep, looks like I've uploaded the wrong version. Will fix this in the next days. Go back to version 1.434 please in order to anchor the controls correct for your screen resolution. Last edited by Baertram : 01/29/19 at 08:39 AM. Could you move the search box a little to the right please? It collides with Votan's Addon List which adds some icons. huh? For me it does not collide, and I'm using both addons too. Could you show me a screenshot of your addon manager please. And please only enable "Votans Addon List" and "Addon Selector" to see if it's really one of these addons. If you are using PerfectPixle update it please. An older version got the bug with moved icons etc. Could it possibly be caused by aspect ratio? I have 16:10 monitor. My monitor is not supporting this (I think). Last edited by Baertram : 01/23/19 at 04:36 AM. Last edited by Octopuss : 01/23/19 at 04:14 AM. Last edited by Baertram : 01/22/19 at 02:55 AM. Please feel free to test it and tell me bugs you find, thanks. Tested back and forth, mid and end word, partial strings, including spaces. Spaces work, dashes don't work (like in AD-Zones for HarvestMap), but might be not nessecary to have this implemented. I'll have a look if I can change the search algorithm to support the dashes but afaik it's lua/ZOs standard. If the rest is working I'm fine, thanks for the test! A search box was added new at the top right corner of the addon manager. If you enter a search term and pres the return key it will jump to the first found entry. Each return key press will advanced to next found entry until you will be at the first again. The selected addon will be shown via a surrounding [> <] frame. It's not that easy, just tried it. ZO_AddOnsList got data with each of the addons, e.g. 224 rows. Each addon got an dataEntry containing some info like addOnFileName, addOnName, addOnDependencyText etc. I'd need to read the addonDependencyText, split the string into a table at the , to get all dependencies. Then find these dependencies in each of the 224 rows of data and check if data[index].dataEntry.addonFileName = DependencyNameOfTable. For 10 dependencies this will be 10x224 checks. Then this needs to be redone for each dependency redundantly to check if the dependency got other dependencies (like LibAddonMenu-2.0 needs to check for LibStub again, and so on). It lags the client and is not really doable sorry. Even if I'd build a sort of indexedList where the name + index in the 224 addons list would be "cached" the lookup would take too long and this list needs to be rebuild at each reloadui as new addons could have been installed then. I don't think this will be performant or work properly. 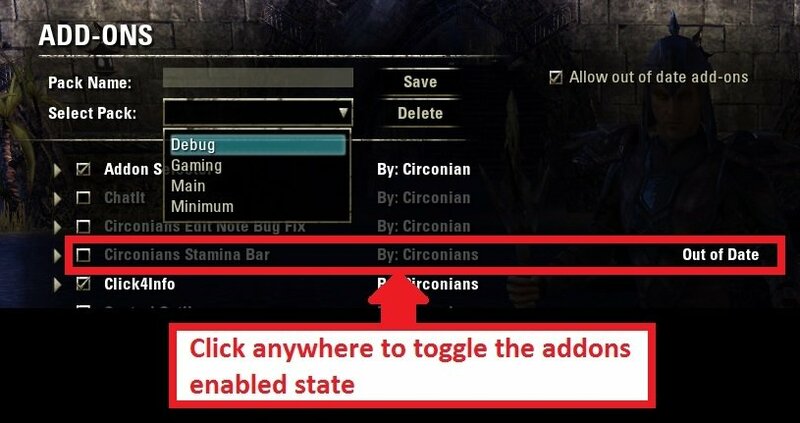 And this addon was only a takeover of Circonian. I want to maintain it and keep it running. That's all. You could crawl the list when saving the package and safe the dependencies along? I would also be happy if I could have an addon option so with each package all Libraries get loaded ? Just a thought. But would it be possible for this addon to check the dependencies and select them along with an addon I try to enable? I've thought about this in the past and it is possible but not always. Haven't check if the UI gives possibilities to enable dependent stuff as well, one would need to crawl the whole list each time which will make the whole thing laggy as hell if you enable many addons via a profile. Maybe I'll invest some time to make my mind about it in the future. Last edited by Baertram : 09/28/18 at 12:35 PM.